On our last day of Hip-Hop with Olwyn all senior classes joined together to perform two routines they learned. It was great fun. Well done girls and thank you Olwyn for the super dance sessions. Well done to our 2nd class girls in Room 9 who put on a wonderful show for their parents yesterday performing the excerpt from 'Annie' that they have been working on in their drama lessons over the last while. Well done girls! We have reviewed our Visual Arts plan. It is available to view in the Home tab under school policies. We are working hard to prepare for our mega Easter Fair,which takes place on April 14th. We are seeking parents to volunteer at the various stations and stall so that we can make the most out of the day. 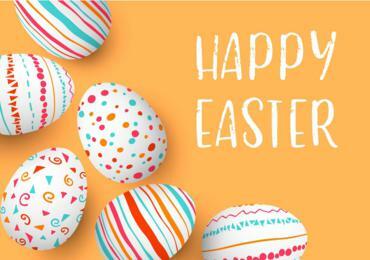 As well as the very popular Easter hunt and the book and toys stall, we are also expecting the Easter bunny to pay a visit. 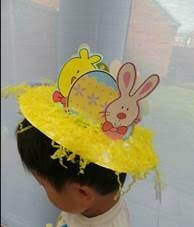 We are also organising an Easter bonnet competition using a paper plate supplied by us. We are hoping for some very creative ideas! Well done to everyone who was so wonderfully supportive of our annual cake sale last Friday in aid of The Caroline Foundation, Caring for Pádraig and our school. We couldn't do it without the generosity and kindness of our students, parents and all of the staff who contribute in so many ways. has a very special place in the hearts of all in St. Brigid's and we are delighted to support the great work for cancer research going on in her name. Thanks everyone:-). ​See the video below for a snapshot of the busy but fun day! Bhí an-spraoi againn i rith Seachtain na Gaeilge. Bhí an ceolchoirm go h-iontach ar fad agus bhí na páistí go léir ana ceolmhar. Bhí cúpla duine ag damhsa, daoine eile ag seinm an feadóg mhór, an véidhlin agus ar an bpianó. Tá tallann iontach sa scoil. Bhí gach duine sár-mhaith!